In a global business environment we must think globally so as to seize each opportunity to maximise business development. 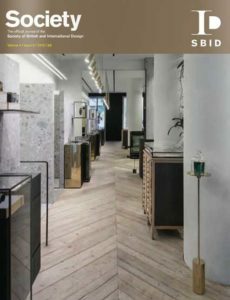 While SBID is very much a mover and shaker, it’s also our aim to help young thriving entrepreneurial business to develop and grow into new markets too. This edition is packed with updates on our industry as well as special features that we hope you will respond to, agree with and possibly even disagree with. Sometimes a business is born from negativity: a solution that is created to resolve a problem will always be a success so don’t sit in silence, we encourage a colourful, open and vibrant forum of ideas and free speech. This community of big, small, rich, diverse and often struggling designers and creators across myriad genres is what makes our industry. It’s not a hobby, it’s a valuable sector so please do read, agree, disapprove and submit ideas… and enjoy this edition of Society!